Have you dreamed of making your own adorable miniature sculpts?� Learn�and create your own adorable sculpted babies with the training DVD and supplies in this Starter Kit.� Enough clay, mohair, and paint for a bundle of babies and save over $16.00! 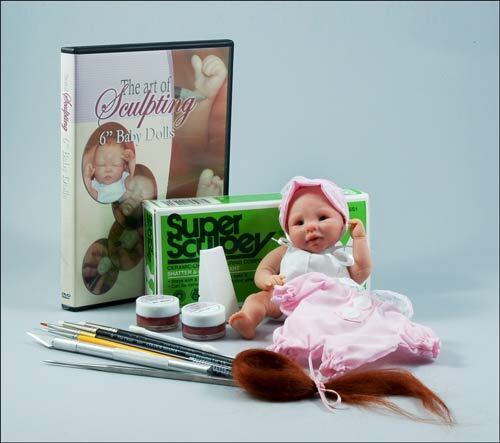 This great kit includes all the supplies and training you need to get started sculpting miniature babies. The training DVD includes step-by-step instructions on sculpting an adorable sleeping baby, chubby arms and legs, how to paint your baby sculpt (including all those adorable baby wrinkles), how to apply mohair, and even how to assemble your little bundle of love. You'll save more than $16.00 on the cost of supplies when you purchase the Starter Kit versus buying these tools and supplies individually. Best of all... there's enough clay, paint, and mohair to make a bundle of miniature babies from this one starter kit! And the high quality tools included will last you for many, many babies to come. Miniature babies are a popular item these days with thousands selling every month on auction websites like eBay and at craft fairs and more. Miniature baby sculpts can sell anywhere from $25 to $225 depending on the amount of detail, the appeal of the expression, the clothing, and the finish of the sculpt (meaning no lumps and bumps). If you've been looking for a hobby that can actually make you money AND that you enjoy, miniature baby sculpting could be perfect for you. You may need a handful of polyfil stuffing or a bag of glass weighting beads for inside the cloth doll body. Most sculptors like to choose their own filling so this is not included, but glass beads can be added below. The DVD also shows the use of a clay palette knife and the acrylic roller. These items are helpful in creating your miniature baby but they are not absolutely required. You can use a kitchen butter knife or a kitchen roller (cover with wax paper) to flatten the clay. If you want the full experience than simply add the items listed below before you add the starter kit to your shopping cart. 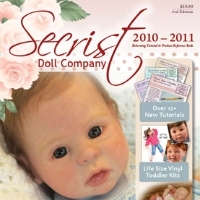 The sculpted miniature baby shown in the picture is not included in the starter kit - it is an example of the type of baby you can create following the DVD instructions and using the tools provided. Note: Included in the Starter Kit but missing from the picture above are the double ended stylus and the needle punch awl tool. These items will be included in the starter kit you receive.